The Alaska Department of Fish and Game has announced opening date for the highly anticipated Copper River Salmon fishery. 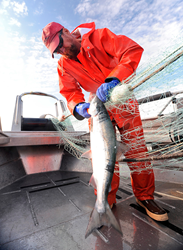 Fisherman John Bocci picks a Copper River sockeye salmon from his net. The countdown is on for fresh Copper River salmon. The Alaska Department of Fish and Game has announced the first opening of the Copper River salmon fishing season. The opener is scheduled for 12 hours beginning at 7:00 am and closing at 7:00 pm on Monday, May 16, 2016. As with all Alaska fisheries, the name of the game is sustainability. Fishery managers must be confident that the run is on track to meet escapement goals (the number of salmon that must make it to the spawning grounds to ensure long-term health of the run) before they provide fishing opportunity. Commercial salmon fishermen have fished Copper River salmon for well over a century, which provides fishery managers a wealth of historical data. Throughout the years, an opening date near May 15 has provided for sustainable yield. However, this year, fishermen have been informed that a short-notice announcement might occur sooner. This decision will be based upon in-river salmon passage data. If fishery managers, biologist's working for Alaska Department of Fish and Game, see an influx of salmon in the river early this week, they may open the fishery before the 16th. In the meantime, restaurants, high-end grocers and salmon connoisseurs will be anxiously anticipating fresh Copper River Chinook and sockeye salmon. The first of these prized fish will arrive in Seattle via Alaska Airlines early in the morning after the first opener. A cook-off featuring top Seattle area chefs happens right on the tarmac, and the rest of the cargo load will be distributed to eager vendors in Seattle and beyond. These first fish are in high demand. Restaurants, seafood markets and grocery stores carrying wild Alaskan salmon from the Copper River can be found on the Copper River salmon website locator tool. Any purveyor of Copper River salmon can add their location to the app for consumers to find. Select the "Tag it" button to add a location. The Copper River/Prince William Sound Marketing Association, a fisherman funded regional seafood development association, works on behalf of the 500 plus commercial salmon fisherman of Coastal South Central Alaska. The association works to build brand awareness for wild Copper River king, sockeye and coho as well as Prince William Sound sockeye, keta, and pink salmon.